Congratulations to young gun Teah Charlton who earned the Round 3 Powerade Breakthrough Player nomination for her stand out 19 disposal game on Friday night! South Adelaide Football Club is pleased to announce that Fleurieu Milk Company has extended their partnership with the Panthers for a further two seasons and increased their support into South's junior programs. The partnership between South Adelaide and Fleurieu Milk, which began in late 2016, will now run through the 2019 and 2020 seasons and has expanded to include support of the Panthers Centre of Excellence programs. Fleurieu Milk Company's logo will remain on the right thigh of all Panthers male game-day shorts, while now also featuring on the left breast of the club's Under-16 and Under-18 guernesys. All dairy products used in South Adelaide's bistro, Jimmy Deane's will continue to be supplied by Fleurieu Milk. South Adelaide Chief Executive Officer Neill Sharpe said the club was thankful for Fleurieu Milk's ongoing support. "It's fantastic to be able to extend our partnership with Fleurieu Milk Company for a further two seasons," said Mr Sharpe. "Fleurieu Milk have been tremendous supporters of our club and we are grateful they have also offered to increase their support to partner with our Centre of Excellence Under-16 and Under-18 programs. "We believe it is extremely important to support home-grown products within the southern community and are extremely proud to continue to grow our partnership with one of the leading businesses within our Zone." General Manager of Fleurieu Milk Company, Nick Hutchinson said Fleurieu Milk were proud to be able to give back to their community. "Fleurieu Milk Company are privileged to be able to enhance our partnership with the South Adelaide Football Club," said Mr Hutchinson. "Like South Adelaide, our business is built around community and we are extremely grateful for the way the general public embrace our company. It is humbling to know we're in a position to be able to give back. "Since our partnership with South began only two years ago Fleurieu Milk have doubled in size. We now employ 45 people from the local area and purchase milk from additional local farms. With Fleurieu Milk being 100% locally owned, this is extremely important to us. "We can't wait to see our growth continue along with our level of community involvement in to the future. Go Panthers!" Nestled in the foothills of the South Adelaide Zone at Myponga, Fleurieu Milk Company began in 2006 with a vision to make farming a sustainable profession for the next generation. Low farm gate prices from dairy processors caused three local farming families to come together, collaborating to produce their own differentiated brand targeted at a niche market within South Australia. The emphasis of all Fleurieu Milk products is quality. They take pride in knowing their milk tastes exactly how milk should taste. They avoid adding any additives, thickeners and preservatives to their products, wanting them to remain as natural as possible. Whilst growth continues, the company wants to ensure a large emphasis remains on community involvement. Local community support is absolutely vital to our success and is undoubtedly what got them off the ground 13 years ago. They want this two-way relationship to continue as much as possible which is why Fleurieu Milk is quite proud to be partnering with the South Adelaide Football Club. South Adelaide's senior men had their first competitive hit out of 2019 with an internal trial match on Friday evening at Flinders University Stadium. In the end it was the more experienced Hoops team (793 senior games to 414) that came away with bragging rights amongst the playing group. More excitingly for Panthers fans it was some fresh faces and up-and-coming players that stood out during the proceedings. Also pleasingly both squads got through the match unscathed despite the sweltering conditions. The teams played four 26 minute flat quarters, with additional drinks break given at the 13 minute mark of each quarter as the temperature pushed close to 40 degrees during the day. New recruit Michael Knoll was adjudged best on ground thanks to an eye catching display. The former Box Hill Hawk was a dominant presence in the air around the ground and showed some positive signs with his ruck craft at the stoppages. Such was his impression on proceedings he was traded from the Hoops to the Navy team at halftime. Young on ballers Jesse McKinnon and Ben Heaslip also impressed the coaches with their work through the middle of the ground. Meanwhile, the elusiveness and speed of Hayden Sampson looks to be a real weapon senior coach Jarrad Wright can deploy across halfback and on the wing this season. Likewise, speedy Tyson Brown looks fit and ready to build on his strong 2018 that was unfortunately cut short following a scary head clash in the final home and away game against Norwood. His dashing run down the western wing and goal from right on the paint on the Jimmy Deane grandstand flank opened the scoring for the evening for his Navy squad. Connor Fairlie, who put on a composed display throughout the match, quickly replied for the Hoops on the end of some swift end-to-end ball movement, before Under-18s graduate James Grimley took a strong pack mark and converted his set shot. Sampson, the evergreen Nick Liddle, Abe Davis and Joseph Haines found plenty of the ball in the early going, as only four points separated the sides at quarter time. Another impressive youngster was Darnell Tucker, who showcased his abilities as a small pressure forward with a strong tackle and accurate set shot from the resulting free kick early in the second quarter. That would trigger a run of six unanswered goals for the Hoops side. Ben Haren crumbed a high ball and snapped a silky left footed snap at the Southern end, before an impressive chain of play between Fairlie, Knoll and Haren lead to Under-18 Daniel Sladojevic kicking the first of his three goals unmanned in the square. Finally, Abe Davis pulled one back for the Navy's on the stroke of halftime thanks to a free paid down field. As the Hoops took a five goal margin into the major break some changes were made to the sides. Knoll and Haren swapped their hoops for navy strips, with inexperienced talls Cameron McGree and Damon Freitag joining the leading team. The changes did little to hinder the Hoops progress as Sampson opened the second half with an early goal, quickly followed by another to Tom Whittlesea, while Jayden Hall capitalised on a poor clearing kick to slot his first. Liam Fitt pegged one back with a tight angled set shot in front of the REDARC Electronics scoreboard, before a strong mark and goal from Brett Kennedy added another to the Navy's tally. Both teams looked to fatigue in the extreme conditions and with a healthy margin between the two sides much of the heat in the contest began to cool throughout the final quarter. Liddle and Heaslip found their way onto the scorers list, while young utility Reece Milsom curled home a running shot towards the end of the quarter. The Panthers senior men get their first look at outside competition this Friday night (6pm, March 8) as they clash with Port Adelaide Magpies at Flinders University Stadium. South Adelaide have put themselves back on the winner's list after knocking off West Adelaide at City Mazda Stadium on Friday night. The Panthers rode a fast start and strong finish to their second win of the season, claiming a 7.6 (48) to 5.2 (32) win over the Bloods. Both sides fought admirably hard in trying conditions, with the temperature still pushing the high 30s despite a delayed start due to the SANFL's heat policy. Injury again effected South's preparations, as Norwood recruit Nicole Campbell and soccer convert Jess Kirk were late withdrawals from the side, opening the way for youngsters Caitlin Radbone and the Panthers first father-daughter product Emily Brockhurst to make their debuts. The Panthers controlled possession for much of the game (223 disposals to 162) thanks to some heavy grunt work from Czenya Cavouras (game-high 29 touches, 10 tackles and nine clearances), Nikki Gore and Teah Charlton (19 touches a piece). South also enjoyed the lion's share of time in their forward half, winning the inside 50 battle 30 to 19. However, they struggled to convert that dominance to scoreboard pressure at times. Three unanswered goals to close the first quarter gave the Panthers a two goal margin at quarter time and a lead they would not relinquish for the remainder of the game. The teams traded blows through the second and third and the competition's leading forward Chelsea Biddell would bring the hosts within two points at the fourth minute mark of the final term. However, goals to Hannah Munyard and Indy Tahau midway through the last quarter would put the result beyond doubt. Young defender Samantha Pratt (15 touches and five tackles) played an important role in a Panthers backline that repelled 13 of West's 19 forward 50 entries. Meanwhile, Montana McKinnon (14 disposals, seven marks and 23 hit outs) continued to press her case amongst the best talls in the competition with another strong showing at the stoppages. Speedy Munyard was also lively with her 13 touches and important final quarter goal. Following a tense opening few minutes, West broke through early as Biddell opened the scoring, coolly slotting a set shot after her side capiltalised on a turnover at the top of the 50. South gave a quick reply through young forward Tahau, who muscled her way to the Panthers first goal following a slick chain of handballs minutes later. After Madison Bennett converted a free kick from a high tackle and Mykala Walker-Murphy slotted her first of the season neatly on the run the margin was pushed to two goals at the first change. Goals proved harder to come by in the second term, as the heat and pressure remained high. Melanie Elsegood pulled one back for the Bloods as she stormed into the goal square, before Danielle Goding replied for South as the siren sounded for halftime, with a set shot from 30m out on a slight angle. A skillful snap from Charlton cancelled out Zoe Venning's 39th second opener for West in the third quarter. Goals to Emma Smith and Biddell, her second thanks to a storming run through the centre of the ground, either side of three quarter time sent some nerves through the Panthers camp as the visitor's lead was cut to two. However, a silky side step and goal from Munyard and a contested mark and finish from Tahau at the top of the square would push the margin to three kicks and beyond reach deep into the final stanza. The win pushes South into third on the premiership ladder and only a game back of equal first Glenelg and Norwood. The SANFL Statewide Super League breaks for a bye this weekend, with South's next game set for 6:30pm, Friday, March 15 back home at Flinders University Stadium. Thank you again for signing up as a Panthers member. Your support is greatly appreciated and we look forward to sharing the year ahead with you! We are pleased to update everyone that our first run of members packs are ready for delivery/collection. All memberships purchased prior to February 14 are now on their way to you in the post or ready for collection at club reception - depending on your selected method of delivery. Club administration is open 9am - 5pm, Monday - Friday each week. However, packs can also be left for collection at Jimmy Deane's outside of office hours if you call ahead. If you purchased your membership after February 14, we anticipate these packs to be delivered to us within the next week. At which point they will delivered to everyone accordingly. If you have any further queries please don't hesitate to call the club on 8186 8200. South Adelaide make changes ahead of Friday night's clash with West Adelaide at Richmond. The Panthers will make at least three changes to the side that fell to Norwood by two goals at the Parade last weekend. Skipper Lauren Buchanan is unavailable for selection, while midfielders Natalie Gibbs and Emogen Johnson (omitted) will also not line up against the Bloods. Returning to the side is vice captain, Elyse Haussen, who was a late omission against Norwood after failing to complete the warm up pre-game. Meanwhile, young goal kicker Mykala Walker-Murphy has been named at half forward for her first game of the 2019 season. Nikki Gore is available for selection after travelling emergency duties saw her head to Darwin with the Crows last weekend. Untried youngsters Caitlin Radbone and second generation Panther Emily Brockhurst are a chance to make their debuts after being named on an extended interchange. Please note due to SANFL's heat policy the start time for tomorrow's game has been pushed back to 7:55pm. Earlier in the evening South's senior men will have their first competitive hit out of the season at their internal trial. Click here to see the selected sides. 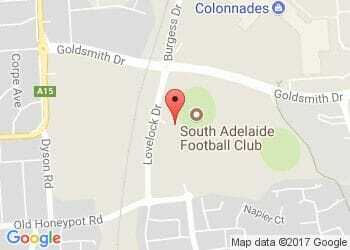 South Adelaide's senior men will have their first competitive hit out tomorrow evening with an internal trial game. The playing group will be split into two teams - navy and hoops - with action getting underway from 6:20pm at Flinders University Stadium. Some changes to teams may be made during the evening. There is lots to like about our preseason so far. Get the inside scoop with trial games just around the corner! Norwood has claimed early bragging rights in the first 2018 Grand Final rematch of the 2019 SANFL Statewide Super Women's League season. The Redlegs avenged their loss to the Panthers in last year's big dance with a two-goal victory at the Parade on Friday evening. South was dealt an early blow, as key on baller Elyse Haussen was a late withdrawl after failing to complete the warm up and replaced in the side by Natalie Gibbs. The two sides played out another physical affair. Goals proved hard to come by, especially in the first half, but neither side could be questioned about their tenacity and commitment in the clinches. The attack on the footy from both teams accurately reflecting the budding rivalry that has grown through their previous tightly contested encounters. South skipper Lauren Buchanan opened the scoring late for the visitors with a calm set shot following a neat Teah Charlton pass deep into the first quarter. The Redlegs hit back through Hannah Dunn in the second quarter and the two sides headed to the major break deadlocked at eight points a piece. Soccer convert Jess Kirk put South back into the lead with her first goal for the club. Another coolly converted set shot off of a Danielle Goding chip pass. However, the rest of the quarter belonged to the Redlegs, as they outworked the Panthers to find space on the tight confines of the Parade and pushed themselves into more dangerous scoring opportunities. Two quick goals to Najwah Allen over the top and one to Monique Hollick put the Panthers precariously down 11 as the teams turned for home. Young forward Indy Tahau gave South hope, with her first career goal cutting the lead to five with 10 minutes to play. However, the visitors could not find that final spark of play that could complete their comeback and a counter attack finished off by former Panther Bree Liebhardt in the dying stages would prove to be the sealer. Young ruck Montana McKinnon (18 touches) fought admirably at the stoppages against one of the competitions best bigs in Leah Cutting. Meanwhile, fellow talls Brianna Wedding and Danielle Goding held their own at opposite ends of the ground. The Panthers women now head to Richmond to face West Adelaide next Friday night (7:30pm, March 1).